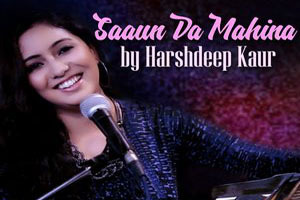 A punjabi folk song sung by Harshdeep Kaur, with lyrics penned by Chaman Lal Chaman. The video of this song is available on YouTube at the official channel Saregama GenY. This video is of 5 minutes 49 seconds duration. Lyrics of "Saun Da Mahina Yaaron"
Lyrics in Hindi (Unicode) of "सौन दा महिना यारो"